Bedding Out is a 30-hour performance by artist-activist Liz Crow that has emerged from the current welfare benefits overhaul that threatens many with poverty. A propagandist campaign that has seen a doubling in disability hate crime. 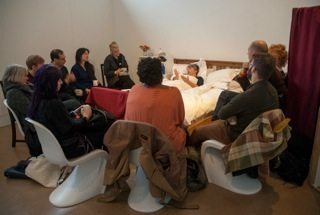 At set times on both days members of the public are invited to Bedside Conversations, gathering round the bed to talk about the work, its backdrop and its politics. For those who cannot visit the work in person, there will be two twitter-based conversations. Bedding Outhas previously been performed at SPILL festival and Salisbury Arts Centre where the piece was set over 48 hours. 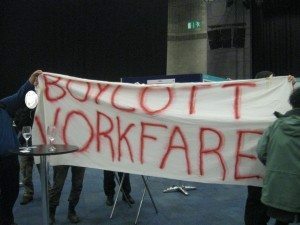 A live feed was viewed by nearly 10,000 people in over 50 countries, generating interest and debate about changes to the benefits system. Follow @RGPLizCrow and use the #beddingout hashtag throughout the 30 hours. Join our Twitter-based Bedside Conversations on Friday 9.00pm, Saturday noon. Friday 1.00pm, 5.00pm. Saturday 2.00pm. BSL interpreter and notetaker available.